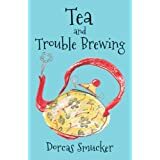 The gift copy of Tea and Trouble Brewing goes, hands down, to the friend of Bertha (see the comments on the post) who lost her 20-year-old son recently. Thank you, Dorcas, and thank you to Bertha for advocating for your friend. And I’m sure that all who read this will wish to say a prayer for Starla and her family.